This information is intended to satisfy the curiosity of anyone who is interested in the clothes worn in the late eighteen hundreds in the west of Cornwall, and also to aid the reconstruction of Cornish costume from this period. These pages are also published in book form and available through An Daras sales. Acknowledgments:My thanks go to the following: Penlee House Gallery and Museum, Penzance, for their help with research and for their permission to reproduce paintings and photographs; Royal Cornwall Museum, Truro, for permission to reproduce paintings; Cornwall Centre, Redruth, and Gibsons of Scilly for permission to use photographs; Sarah Thursfield for endless letters about styles and patterns; Christina Jane for her theatrical costumier expertise; Marjorie Cardew, Millie Roberts, Marjorie Holmes, Rita Howells and Mary Williams for their memories; Jenefer Lowe and Rob Hogg for modelling and for help with things technical; and Dave, Ben and Elizabeth Stewart for their patience and encouragement. 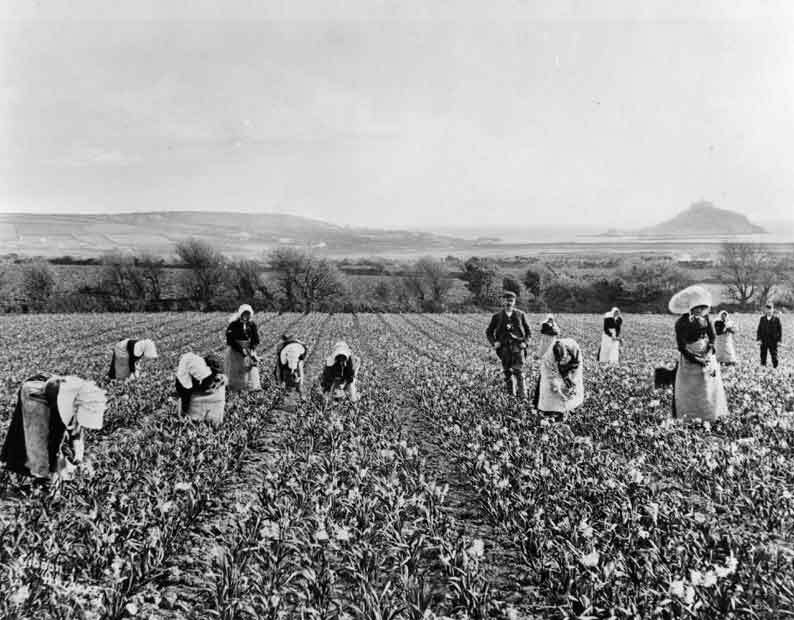 Introduction:Working clothes worn in the west of Cornwall changed very little during the nineteenth century. 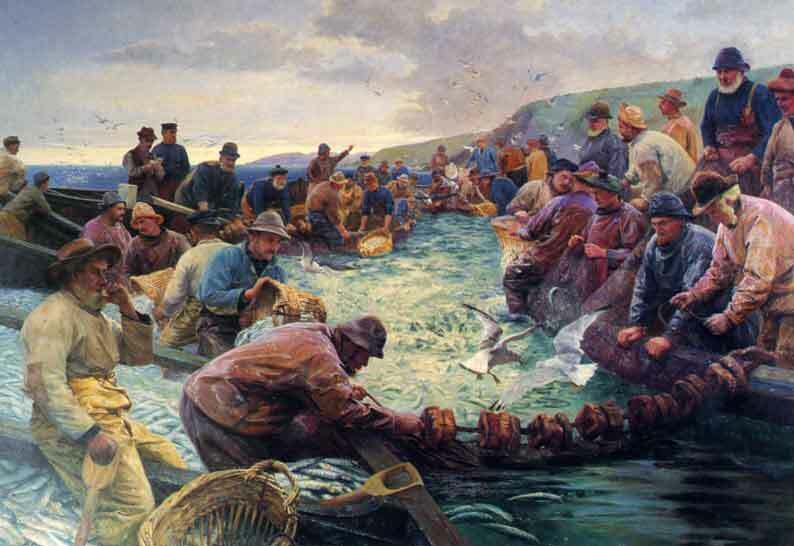 The industries of fishing, mining and agriculture dictated very much the everyday wear of the people. Although the clothes worn reflected the styles of Queen Victoria�s kingdom, changes were slow to reach the far west, making it always a little behind the times. Regional variations within the Duchy were very strong, and even with the introduction of better communications and transport, with the event of the coming of the railway, traditional local styles hung on well into the twentieth century. 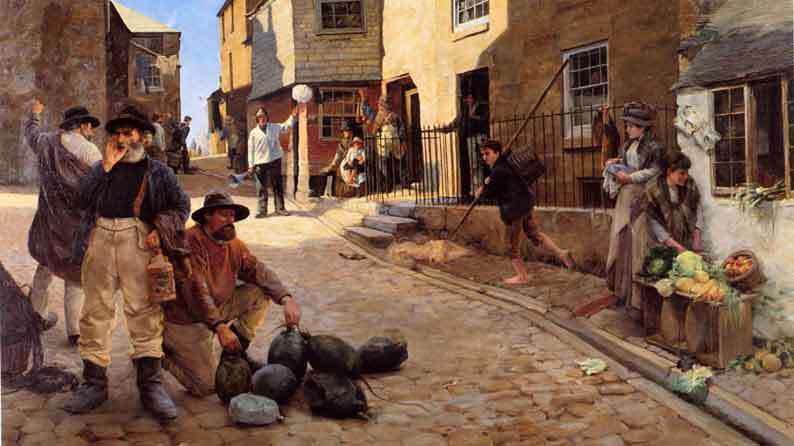 The strongest evidence of what was worn in the Newlyn area at the end of the eighteen hundreds can be observed in the paintings of the Newlyn Colony of Artists who painted the local people at work in the Penzance area. 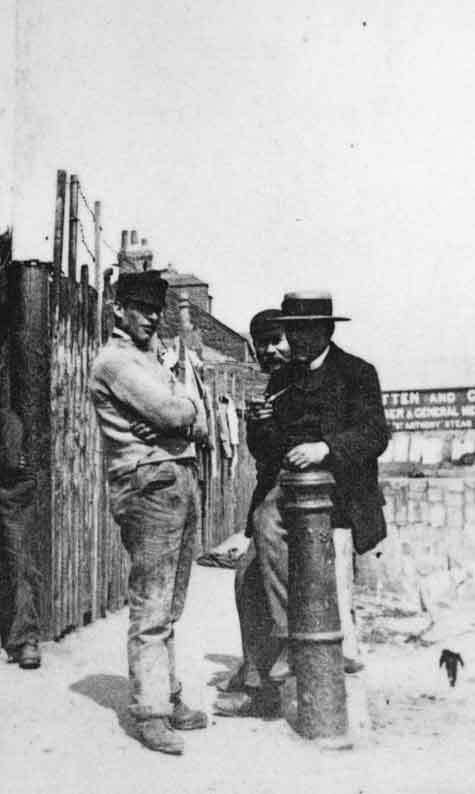 Early photographs of West Cornwall also show the everyday wear of the people. SKIRTS worn at the time in West Cornwall had a flat, sometimes gored front, with most of the fullness at the back, either gathered or in cartridge pleats (see plate 1). The material used was serge, flannel or heavy cotton drill, and a button or hook fastened the waistband. The length was mainly just above the ankle, and pin-tucked pleats were often added to give weight and fullness to the hem of the skirt. Colours were dark: brown, grey and black, but occasionally beige or light grey. 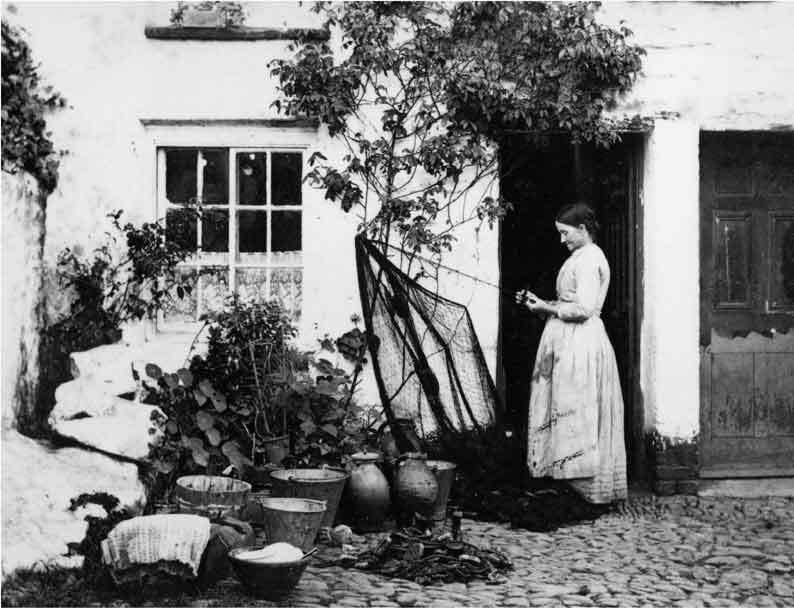 APRONS were made from heavyweight cotton, canvas or hessian, sacking. White aprons (and gooks, see HATS) were often made from flour sacks obtained from the local mill, which were boiled until they were bleached white. Brown sacking aprons (known in West Cornwall dialect as towsers) were worn for dirtier jobs, sometimes over the top of white aprons. Aprons were very wide, nearly reaching all around the skirt and were about six inches shorter than the skirt length. They were gathered into a narrow waistband and the ties passed around the back to meet again at the front in a small bow (see plate 12). This was sometimes tucked into the waistband. One of the lower corners of the apron was occasionally tucked into the waistband on the opposite side (see plate 3). This has sometimes been mistakenly interpreted as a shawl worn around the waist � a style that was never used in Cornwall at that time. To keep the apron firmly in place during heavy work or in windy weather a second tie often attached the two apron sides together across the back of the skirt, roughly eighteen inches below the waistband (see plate 4). SHAWLS were always made from wool, usually fringed, but sometimes just left raw-edged. They were a plain, checked or plaided weave, and although they could be quite bright in colour, they were mainly subtle dyes. 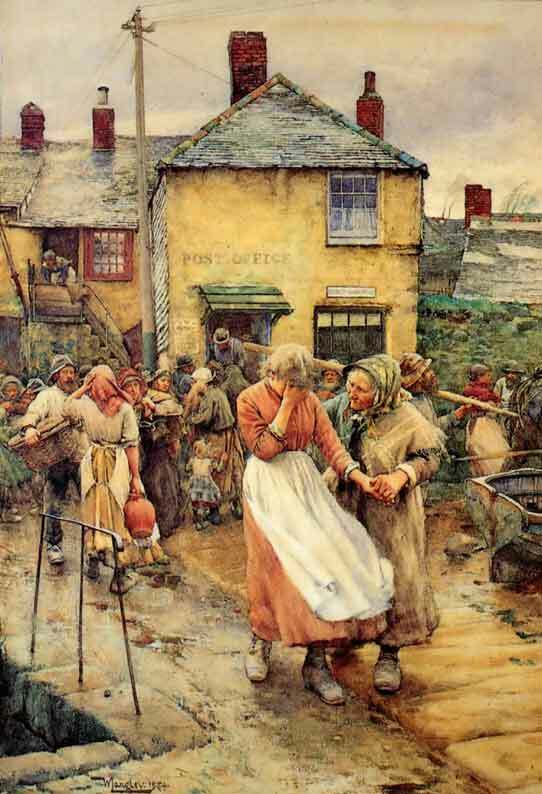 Working women in the Newlyn area wore short shawls at the end of the nineteenth century; the edge fell half way between the shoulder and the elbow (see plates 2 and 4). Shawls were worn quite firmly around the neck, fastening with a pin, not brooch, just under the chin. This caused the front of the shawl to be open across the chest and allowed the arms full movement for work. These small shawls were also worn as headscarves (see plate 2). HATS of all kinds were worn in West Cornwall in the late eighteen hundreds. Straw hats were popular, ranging from large brimmed hats to straw boaters which were worn horizontally on the head (see plates 7 and 12). Shallow bonnets made from dark coloured felt or straw were often worn by older women over a white, cotton bonnet edged with a frill (see plate 2). Most hats were trimmed with ribbon. However, the most interesting hat worn by the working women of Cornwall was the gook, from the Cornish language word kogh meaning hood (see plate 6). These bonnets were worn through the eighteenth, nineteenth and early twentieth centuries, protecting the wearer from the sun, wind, dirt and dust of outdoor work. Each village had a different style of gook, and all the women in that village wore the same style (e.g. the ladies of Gulval, see plate 5). Gooks (and aprons) were often made from flour sacks from the local mill which were boiled until they were bleached white, or from heavy weight, white cotton. They were made to last, involving yards of material, string, cord or sometimes rope to strengthen and support the shape. In the early twentieth century gooks were made from pastel coloured cotton, either plain or with a small print. FOOT WEAR for the working classes had to be hardwearing. Small-heeled, button boots were worn (see plate 4), but many women wore ankle-high, lace-up boots, like the men. Shoes were also worn � these were flat, slip-ons (see plates 2 and 7). This subject needs to be researched further. SHIRTS were a square cut with the shoulder seam falling a little way down the arm (although shaped sleeves and yokes had been worn elsewhere in Great Britain since the middle of the nineteenth century). The back and front were often cut as one piece, with the fold lying across the shoulders, and a hole cut for the head and the front opening. Sleeves were added, and the side seam and sleeve seam were sewn in one. 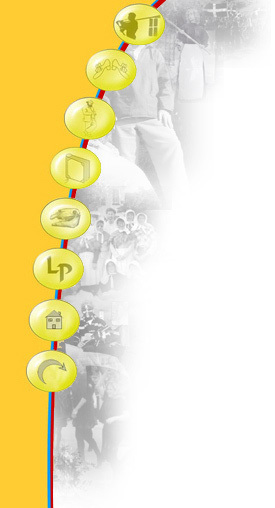 The front opening was short, only two or three buttons long, and the shirts were collarless. They were very generous and loose, and the recommended length of a man�s shirt in the mid eighteen hundreds was down to the knees. The shirts were made from a medium weight cotton, and colours ranged from dark brown, rust and grey, to beige, apricot and light grey. TROUSERS were made from flannel or serge and were dark colours plus beige or light grey. They were fairly loose all over, had a high waist, and the centre back seam was much longer in the nineteenth century than nowadays, making the trousers baggy at the back. Often, they were held up by braces. They had a button fly, and the front pockets sometimes had a flap which could button down or button up, possibly to secure the contents of the pocket when the wearer was at sea (see plate 9). Some farm workers wore yarks � this is a Cornish dialect word meaning binder twine or straps worn around the lower trouser leg, under the knee, to give the trouser knee more flexibility when working, and to prevent snakes and mice from climbing up inside! 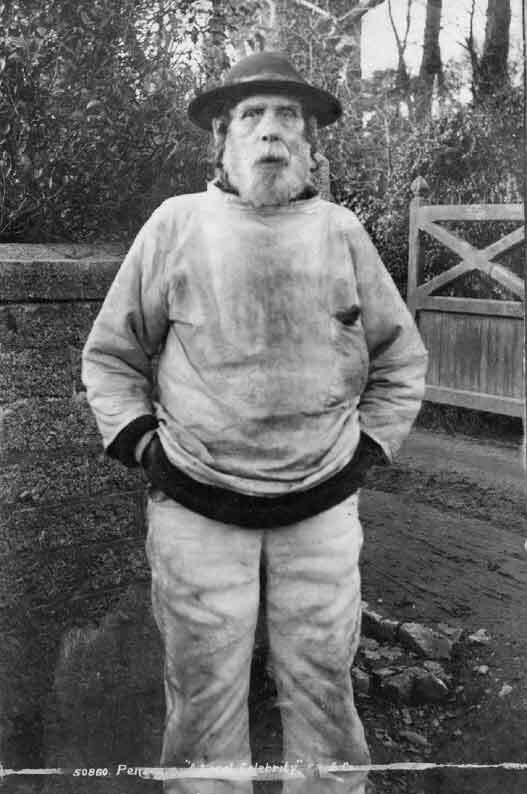 SMOCKS were, and still are, worn by fishermen in the west of Cornwall. 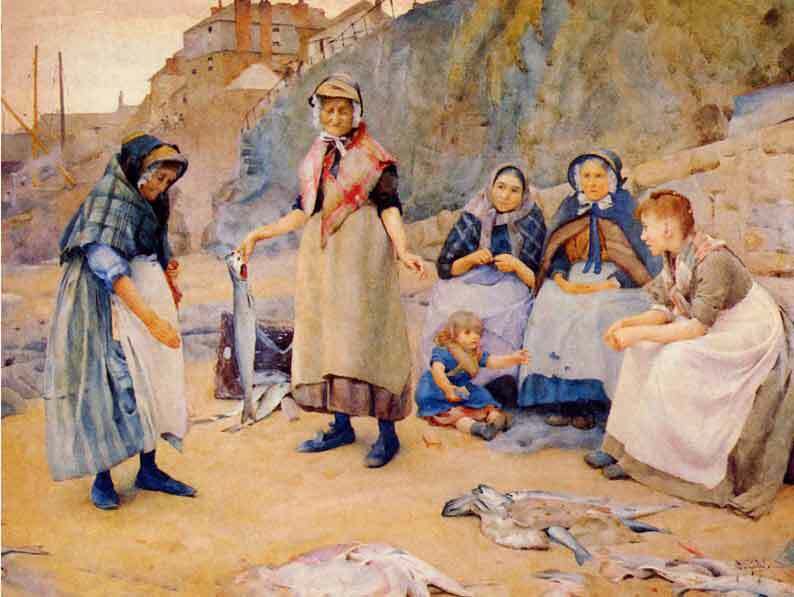 Newlyn fishermen�s smocks are �T� shaped with a wide, straight neck and a stand-up collar, or a small slit at the front with a flat collar (see plates 8 and 10). They have traditionally been made from sailcloth or a very heavy cotton drill, so are ideal garments to protect an outdoor worker from wind, rain and sea spray. 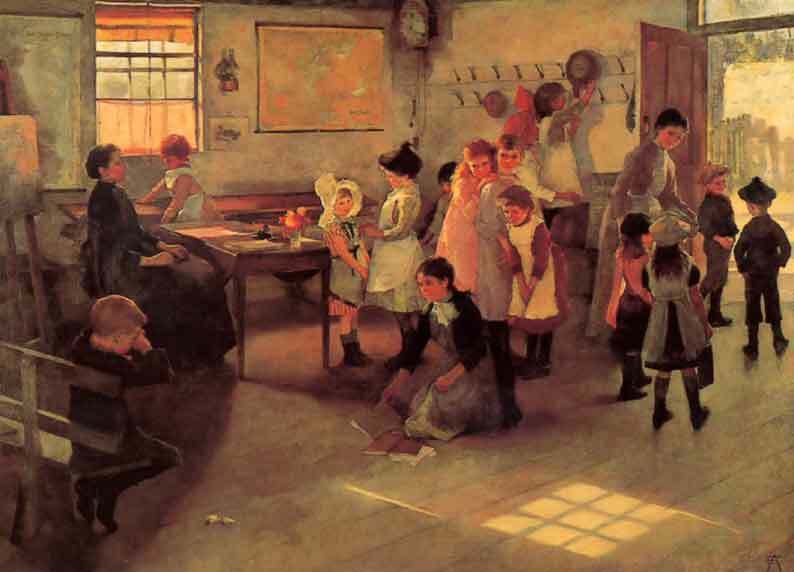 Colours at the end of the nineteenth century varied from greys and browns to cream and light grey. 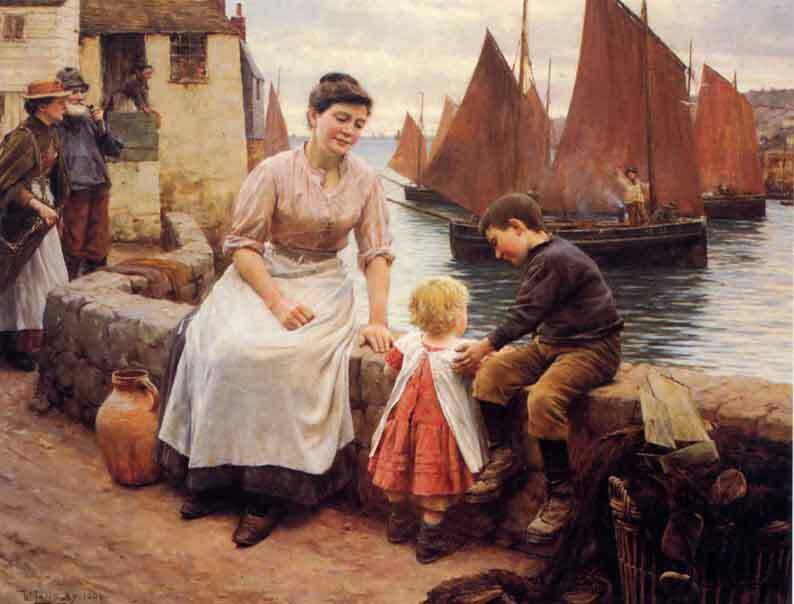 GUERNSEYS (knitted sweaters) were known in the Newlyn area of Cornwall as worsted-frocks. They were knitted on long stocking needles using navy coloured, four-ply worsted. The style was similar throughout Cornwall: they were knitted in the round until the armhole, then the back and front were knitted separately until the shoulder, when both parts were knitted together, leaving the neck to be finished later. Stitches were picked up from the armhole and the sleeves were knitted on. This gave the garment a �T� shape, with a dropped shoulder seam. The pattern across the chest, upper back, and sometimes the top of the sleeve, varied with each garment, so that each fisherman wore a different pattern. WAISTCOATS were mainly worn by agricultural workers. They were short, but usually covered the top of the high-waisted trousers, and they had a high button fastening at the front. Occasionally they were made from leather or suede, but mostly they were made from woollen cloth, back and front. The colours were dark or browns (see plates 7 and 8). HATS were always worn, and there were a variety of styles in West Cornwall (see plate 8). The traditional fisherman�s sou�wester shape was popular, made usually from oiled cloth, in dark or light colours. A large version of the Scots� tam-o�-shanter was very often worn (see plates 7 and 8). 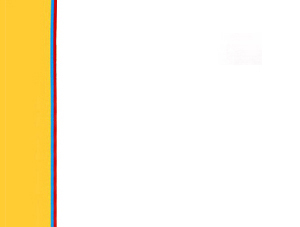 It was made from wool or cloth and was always a plain colour, never plaid. Round-topped, felt hats, similar to deep bowler hats were also popular (see plate 8), as were flat caps with small peaks, made from either cloth or canvas. Straw boaters were rarely worn by working men, but wide-brimmed, straw sun-hats were common in agricultural areas. BOOTS worn by working men in the nineteenth century were very similar to the work boots of today: they were mainly large, heavy lace-ups, which covered the ankle. Tall boots were also worn, mainly by fishermen (see plate 3), who also wore boots up to the thigh at sea. Metal shapes called scutes (Cornish dialect) were tacked onto the soles and heels of boots to slow down wear, and lengthen the life of the leather. Nails were driven into soles and heels for the same reason. The sound made as these metal-clad boots moved on the slate floors helped to create many step dances. In West Cornwall in the late nineteenth century children from working class families wore cut down versions of what their parents wore, but otherwise looked very similar to Victorian children from elsewhere in the British Isles. GIRLS often wore dresses instead of a blouse and skirt, with a pinafore over the top. 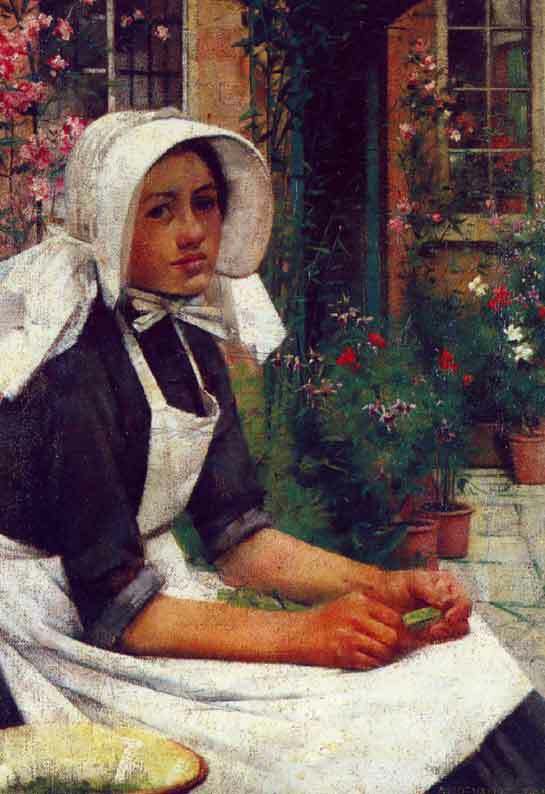 This either took the form of an apron with a bib, which had straps that went over the shoulders to join the waist ties, or, for mainly younger girls, the pinafore would be a loose coverall (see plate 12). This tied at the back of the neck, and had frilled, cap sleeves. Dress length varied from mid calf to just below the knee. High, button boots were popular, or ankle high, lace-up boots, which were worn with long or short stockings (see plate 11). Girls wore gooks, like their mothers, which, for economy, were often made in an adult size, and the child had to grow into it. Children from wealthier families wore gooks made to fit them. Girls also wore tam-o�-shanter berets and horizontal straw hats. BOYS wore worsted-frocks (see GUERNSEYS), like their fathers, over loose, collarless, �T� shaped shirts. Trousers were also loose, younger boys wearing them at calf length (see plates 11 and 12), and all wore ankle high, lace-up boots. Berets and soft caps with small peaks were worn, and also straw sun hats.